The once great Indochinese kingdom that's home to glorious Angkor Wat & the proud Khmer civilization has seen a tourism boom in recent years, now welcoming nearly 2 million visitors yearly to capital Phnom Penh & the cultural & ecological riches beyond. Started by Tripatini Aug 26, 2018. Started by Roy Stevenson Jun 1, 2017. Started by Tripatini Jun 5, 2013.
what makes bucolic Ratanakira province Cambodia's hidden gem? Started by Tripatini May 26, 2013. You need to be a member of Cambodia to add comments! Beng Mealea Temple near Siem Reap. Have you been fond of climbing at the forsaken houses or new buildings back in the boyhood? When you walk through the future or former rooms, flats, corridors or balustrades, drawing pictures in your mind… It was so interesting, although slightly creepy sometimes. My wife and I are travelling around the world on a 500-day honeymoon. In each region we pick one luxury boutique hotel to partner with exclusively for said region. We post two articles per resort on Honeymoons.com as well as numerous social media posts across Twitter, Facebook, Pinterest, Foursquare, Instagram, YouTube, etc..and most importantly each partner becomes the exclusive resort in their respective region on Honeymoons.com - If anyone in this group represents a luxury hotelier/resort in Cambodia, we would love to talk more. Please drop us a line (MikeAnne@HoneyTrek.com) and we can answer any questions and forward over our formal proposal for your review. Hello, all! 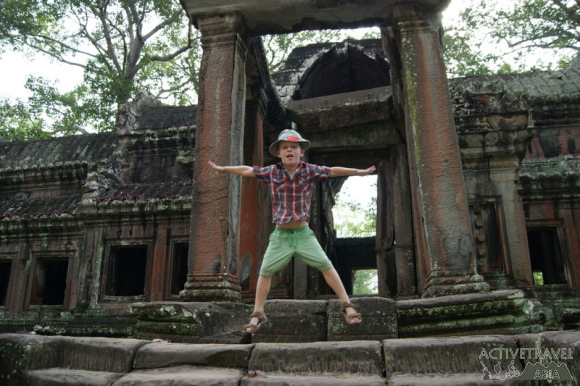 A fellow Tripatini member has a question about tours to Angkor Wat from Thailand as opposed to Cambodia. To help, please reply not here butat this link to our Ask A Travel Pro forum. Thanks!! Tripatini now has a group devoted to Koh Rong and neighboring islands off the Sihanoukville coast! Click here to check it out. My name is Trung and i handle online marketing for my travel company. As an ongoing process to increase the link popularity for my company's website, i am looking for some good quality inbound links. I' m sure this exchange would benefit both of our sites, helping towards increasing both of our ranks in search engine positioning. If you are not the concern person please forward this email to your webmaster, please. Please add our site as detail below and send me the link back where i can find our site. P/S: Remember to send me your site detail for adding in our site. We are not spammers and are against spamming of any kind. We aresending this mail with sole intention of link exchange for mutual benefit. If you are not interested in Link Exchange then you can reply with a simple \"NO\",We will never contact you again. A Tripatini member has a question on travel to Cambodia. Please click here to lend a hand. Thanks! I just read that Air France will resume flights to Phnom Penh for the first time since c.1970. How much will this boost travel to Cambodia? A few months Tripatini ran a story about the cruise ship showdown in the Mekong River Delta. Now a manager at one of those companies, Compagnie Fluviale du Mekong (CFM), says these routes may be imperiled by environmental changes. "I feel that global warming and the eventual effects of China’s dams in the Upper Mekong might lower water in a irreparable way," says Ship Manager Yves Boccuni. "We certainly will have to rethink Mekong cruises within the next decade." He urges the formation of an association of competing cruise lines to cope with this and other problems. Would these competitors really cooperate much with each other?